Shri Prem Nagar Ashram is the premier Ashram established by Shri Hans Ji Maharaj and further developed by Jagat Janani Shri Mata Ji and	Shri Satpal Ji Maharaj. Situated on the banks of Ganges, Hardwar is one of the holiest pilgrimage places in India. For thousands of years, it has been the chosen retreat of saints, sages and pilgrims who after retiring from worldly involvement pursued a solitary life of study, meditation & austerity. Shri Prem Nagar Ashram is situated on Jwalapur Road, 3 kilometres from the town of Hardwar, between the major pilgrimage places of Hardwar, Jwalapur and Kankhal. Located as it is between the swiftly-flowing yet serene Ganges and the foothills of the Himalayas, it is an ideal and tranquil setting for spiritual practice. The twin peaks of Chandi Devi and Mansa Devi, capped by temples, are visible from the Ashram. The sounds of nearby temple bells and devotional songs are carried on the morning and evening breezes, mingling with birdsong and augmenting the peaceful and contemplative atmosphere of the Ashram. This dream has come true, through the combined efforts of Masters and devotees over the years. From 1950 onwards the work began in earnest. Devotees got together to level the land and construct a hut where Shri Hans Ji Maharaj and a few devotees lived. From this humble beginning it has grown into a huge and uniquely beautiful showplace of more than 1000 rooms. Indian ashrams are traditionally places where saints and sages practise meditation and where spiritual knowledge is passed on from Master to disciple. The ashram represents purity, virtue, spirituality and high ideals. It is a place for sharing the highest wisdom. Not just retreats, ashrams are ideally centers of learning, similar to the great monasteries of Europe. Here, sincere aspirants are initiated into the techniques of meditation, along with learning the art of selfless service and studying the scriptures and teachings of the Saints and Masters. Prem Nagar enshrines the twin ideals of service and meditation. As soon as a person enters the front gate, he experiences the aura of peace.The scriptural quotations lining the main driveway illustrate the fundamental unity of all religions, which is Self-realization and merging of the individual soul with God. 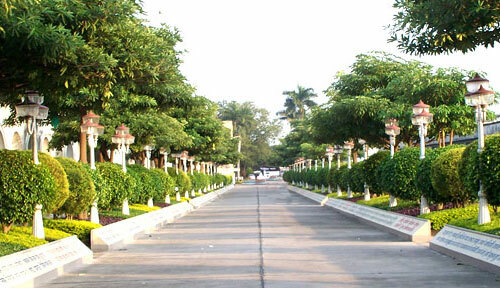 The beauty of the Ashram is further enhanced by approximately 250 varieties of flowers and different types of trees. On the eastern extremity of the Ashram is the Ganges, on the bank of which bathing facilities (‘ghats’) have been constructed. Shri Hans Ji Maharaj passed away in 1966, and in his memory a shrine was built by his wife, Shri Mata Rajeshwari Devi, and his son, Shri Satpal Ji Maharaj, who took over the reins of his mission and continued his noble work. 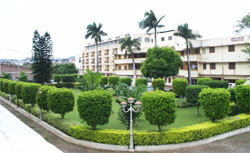 Under their guidance the Ashram flourished and expanded, growing more beautiful year by year.